Note: A stakes winner at Woodbine last year, he was 2nd in the voting for Canadian champion 2-year-old colt. His only good race this year was a 2nd place finish in the Lane's End at Turfway behind the late With a City. 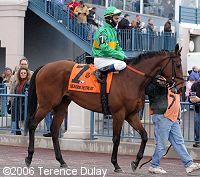 His final prep was a 32 1/2 length loss in the Blue Grass at Keeneland. Went 5 furlongs in 59 2/5 and galloped out 6 furlongs in 1:13 "and change" at Churchill Downs. His connections decided that was good enough that they will go on to the Derby despite his poor race last out. He was never really in contention in the Derby and finished a distant 10th.